Ayoma is a technical lead at WSO2. Prior to joining WSO2, Ayoma worked at Interblocks Ltd. as a software engineer where he was responsible for banking backend administration and batch processing modules. 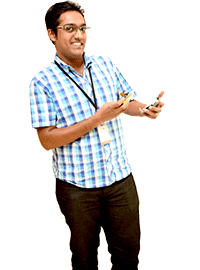 He holds a first class bachelors degree in information technology from University of Moratuwa, Sri Lanka. He is also an oracle certified professional java programmer and an oracle certified expert web component developer. He enjoys experimenting with electronics, reading, and spending time with bonsai trees.